InventoryBase is the most advanced property inventory and inspection management solution for inventory clerks, residential and commercial property managers and letting/estate agents. 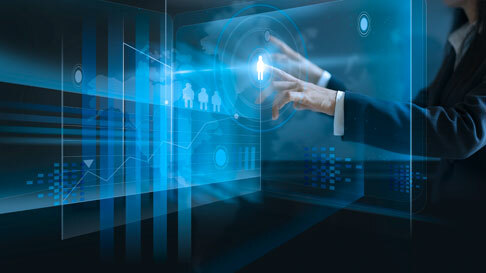 Streamline the end-to-end reporting process, capture descriptions and conditions on-site effortlessly using your own custom dictionary and templates, and conduct inspections in a way that suits you – audio dictation, handwriting or digital entry without the need for an internet connection in the field. Access the InventoryBase Dashboard from any location on any device with a browser, including PC, Mac, Apple iOS or Android. 1. Portable and Offline Reporting - Produce reports in a browser or on-site using our mobile app for tablets and smartphones, without the need for an internet connection. 2. Global Dictionary - Global Dictionary Add your commonly used terms and phrases to your dictionary pre-filled with hundreds of rooms, items, conditions and description to speed up data entry. 2. Pre-Set Templates - Create unlimited report templates to load or pre-load into new reports. 3. 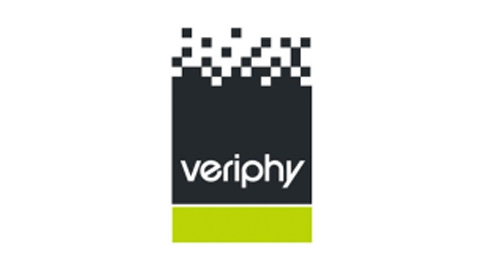 Document Version History - InventoryBase stores all report history throughout every tenancy lifecycle, reducing the potential for lost tenancy deposit claims. 4. Web Based Reports - Grant clients access to view reports online instantly, share reports with tenants and landlords via a private URL, print, or save as PDF. 5. Digital Signatures - Capture agent, landlord or tenant signatures on the app or via the browser using a mouse or Stylus pen. Eliminate the need for paper based reports. 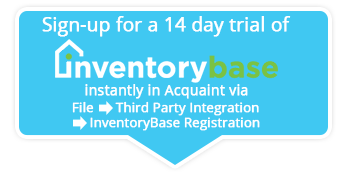 If you already have an InventoryBase account set up, the integration in Acquaint is configured via File->3rd Party Integration ->InventoryBase Authentication. Enter your InventoryBase account credentials (you only need to do this once) and Acquaint will then on a daily basis upload your property data. You can add inspections and inventories directly in InventoryBase (refer to their Online Help) or in Acquaint by creating an appointment with a type of Inspection or inventory and Acquaint will automatically create an inspection in Inventory Base. The property will be created if it doesn't already exist within InventoryBase. Complete your Inspections and Inventory reports via the web or App when you marked the InventoryBase report as Closed (this is the last stage in the process, which is when all parties involved are happy with the report) this will trigger the report to be sent to Acquaint. Every half an hour Acquaint will check and download inventory and inspection reports that have been closed within InventoryBase When Acquaint downloads new reports a Desktop Alert will be shown on User's PCs. A Home Page Reminder is also displayed for 'InventoryBase - Reports To Review'. 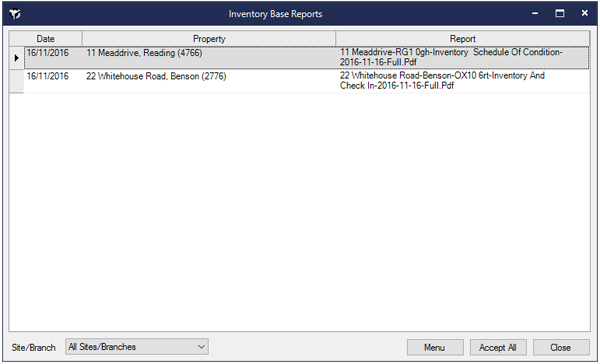 When either the Desktop Alert or the Home Page Reminder is clicked the InventoryBase Reports screen will be displayed. This will show all downloaded reports that haven't been reviewed yet. Double clicking on a row or clicking on the button in the Report field will load the PDF report. Clicking the Accept All button will mark all reports in the grid as accepted.